Pantherella "Mapperton" socks in Fair Isle knit. Ribbed cuff prevents slipping. Solid cuff, toe, and heel. Fine-linked toe seams. Half-calf length. Cashmere/nylon. Made in England since 1937. Medium Size: UK (7 1/2-9/12) EU ( 41-44) US (8 1/12-11). Pantherella socks in herringbone knit. Reinforced heels and toes for durability. Finely ribbed cuffs prevent slipping. Half-calf length. Merino wool/nylon. Pantherella socks in herringbone knit. Reinforced heels and toes for durability. Finely ribbed cuffs prevent slipping. Half-calf length. Merino wool/nylon. Made in UK. 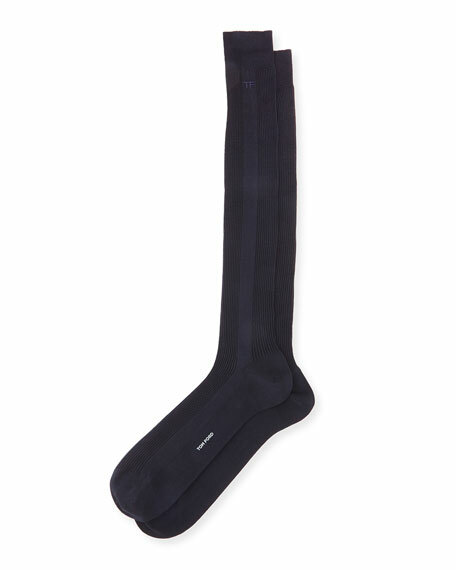 Pantherella "Porter" socks in graphic knit. Reinforced heels and toes for durability. Finely ribbed cuffs prevent slipping. Half-calf length. Merino wool/nylon. Made in UK. Birdseye pattern lisle knit. Banded cuff; solid toe and sole. Mid-calf length. Cotton/nylon; machine washable. Made in England. Medium Size: UK (7 1/2-9/12) EU ( 41-44) US (8 1/12-11).